Editor’s Note: Today we would like to bring you Part 2 of Carla Bigio’s piece on what makes each Madrid the gastronomic giant of Spain. Click here to read Part I on Barcelona. If I could describe Madrid in one word, it would be tradition. Tradition reigns, in the food, the service and the style. Polar opposite to Barcelona, capital of spontaneous bursts of creativity – Madrid has its moments – but you have to respect the pride in Madrid’s reluctance to stray from its heritage and roots. Only 3 months in, and I could tell that there is a completely different vibe in this spanning Metropolis. People here enjoy food, and they enjoy eating out. Just stroll through the city center on any given night, and you’ll find throngs of people out and about, whether it is for a fancy evening at a restaurant, or a quick snack and beer with friends. What strikes me the most, though, is the quality. In Barcelona, you need a fat wallet to enjoy top quality food. Not so here, where abundance is key and quality of ingredients and service is not only a given, but expected! My first few forays in the food culture of Madrid have been eye opening. What strikes me is that while Barcelona has an array of creative cocina de autor or cocina de Mercado (loosely translated as Avant garde food), Madrid has restaurants that may not be so creative, yet you have many, many different cultural and regional foods to sample. From tapas, Andalusian, Basque and typical tabernas, Madrid specializes in the regional restaurant. A few weeks ago we had some friends in from Barcelona and did a mini- gastronomic tour. There is no place better to start than the Mercado de San Miguel, right off of the Plaza Mayor in the heart of the old city. 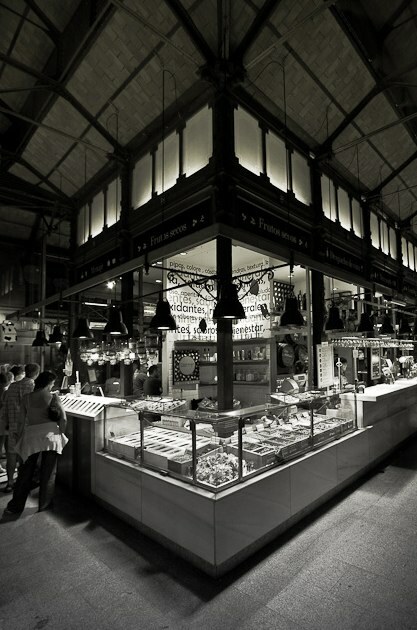 A beautiful refurbished market, it is reminiscent of the Boqueria on the outside, but on the inside, not so much. With just a paltry amount of market stands, people of all ages make a beeline to this place to sample the wide array of stalls offering different types of food. From Italian burrata and mozzarella, to oysters or croquetas the choice is limitless. Even chocolate covered fruits, and of course, wine, champagne, and gin and tonics abound. You just need a little bit of patience and some creativity in getting around the hundreds of people milling about. But, if you go there early on a weekday, you will be rewarded with fantastic food at great prices. After a glass of wine and some cheese, we decided to go Cava Baja Street, chock full of tapas bars. We chose El Schotis, local classic still owned and operated by the original owner. As we glanced at the menu and decided on some Boquerones (white anchovies) and Croquetas, we ordered our drinks. All of a sudden, the owner plops down a massive plate of bread with Sobrasada. We had completely forgotten, that here in Madrid, if you’re at a tapas bar, when you order a drink, you get a tapa! It was the best Sobrasada we’ve ever had! I am not sure if it was because it was free, but who cares right? When our food arrived I notice the first thing that differentiates Madrid from Barcelona. The portion sizes. Here in Madrid, they are absolutely enormous. Spectacularly good, the boquerones were tangy with just the right amount of garlic, and the croquetas were addictive. Homemade into small balls instead of the two bite logs, we couldn’t stop eating them, even though we were all pretty full. Another restaurant not to miss is Casa Lucio. 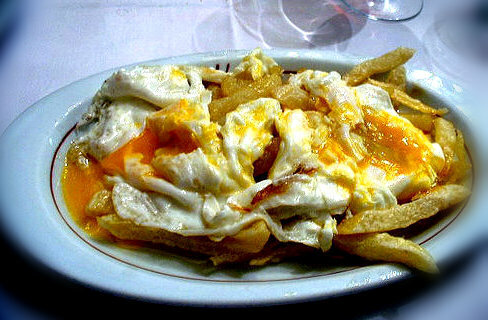 Casa Lucio is renowned to be the birthplace of “huevos estrellados”. If you aren’t familiar with that dish, it’s basically eggs, lightly scrambled on top of French fried potatoes, and of course with some jamon added in. We opted to go to Taberna “Los Huevos de Lucio” for its more relaxed atmosphere. Now, here is the next difference I noticed in comparison to Barcelona. We were right in the heart of the city again, and this place was packed, not with tourists, but locals. Does anyone do anything other than eat out here? Obviously, the thing to order here is the huevos estrellados. As we were waiting, we counted about 6 or 7 plates of these flying by us, some with jamon, and others with chorizo or morcilla. I have to say, that for such a simple dish, this really hits the spot. As I mentioned before, I love eggs, and sometimes simplicity is key. Basic and perfectly cooked, it was magical, but don’t be fooled, as simple as this is, it can be a disaster. The egg yolk could be overcooked, and the potatoes too oily. But here, one thing that can be guaranteed is that you will have a fantastic pair of “huevos”! The last place I would like to mention is a personal favorite of my fiancé’s, “Pan de Lujo”. Tucked in Madrid’s ritziest neighborhood of Salamanca is a personal favorite of my fiance, a little hide way spot few are familiar with. I noticed that the menu was full of classics, with a twist. The decoration was also a tribute to whimsy, the back patio designed to look like a bathtub, with its very own giant rubber ducky. Every dish we had that day was fantastic, but two options really impressed me. These two dishes are so old school, that they’re hip. One was “Consommé de Jabugo”, clear, flavorful broth, spiked with just the tiniest bits of Spain’s ubiquitous jamon. My soon to be father in law ordered the most humble of Spanish dishes, the Menestra de Verduras, or basically vegetable stew. I was very confused that a restaurant as trendy as this would serve something so basic, but I now know why it is a menu staple. Brought over to the table in an oven bag, it was cut right in front of us, and poured into the bowl. Full of spring’s freshest bounty, peas, artichokes and fava beans, it was then topped with a lightly poached egg. Incredible. Perfectly cooked, bursting with flavor and not mushy at all, this isn’t your grandmother’s veggie stew. Not so much into vegetables? They also had one of the best steak tartar’s I’ve ever tried. These are only a few noteworthy places, not to be missed if you’re in town. I haven’t even begun to scratch the surface of this magnificent city, but I am excited to continue searching out the tradition that makes Spain one of the capitals of Gastronomy. Madrid is the perfect place to discover this, and I am loving every minute of it!